Christmas is one of our favourite times of the year at NeoGrass and we’re busy getting into the spirit of things here at head office. Of course, with a warehouse full of artificial grass, we have lots of offcuts that we are utilising to create Christmas decorations for the office. And, if you have recently had artificial grass installed at your home, then the chances are you may have some leftover pieces of grass of your own. Rather than throwing them away, put them to good use this Christmas by getting creative and making your own decorations for your home and garden. There are lots of ways in which you can use artificial grass offcuts, and there are plenty of things you can utilise them for over the Christmas period. We have been searching across the Internet for some inspirational ideas from other people who have been using fake turf for the festive period. 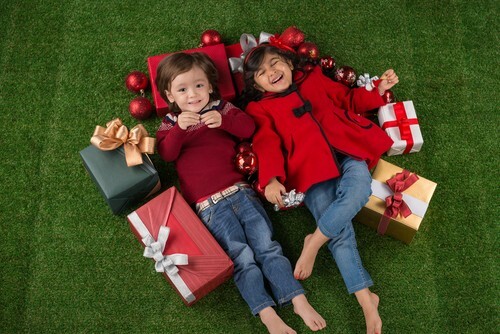 Here’s our list of 5 creative uses for artificial turf this Christmas. Wreaths have had a significant meaning at Christmastime for many years, having been popularised during the Victorian times. From a Christian perspective, the Christmas wreath is intended to represent the unending circle of life. The thorns of the wreath represent the crown of thorns worn by Christ on the cross and the red berries represent the blood of Christ. And, religious connotations aside, they look fabulous! 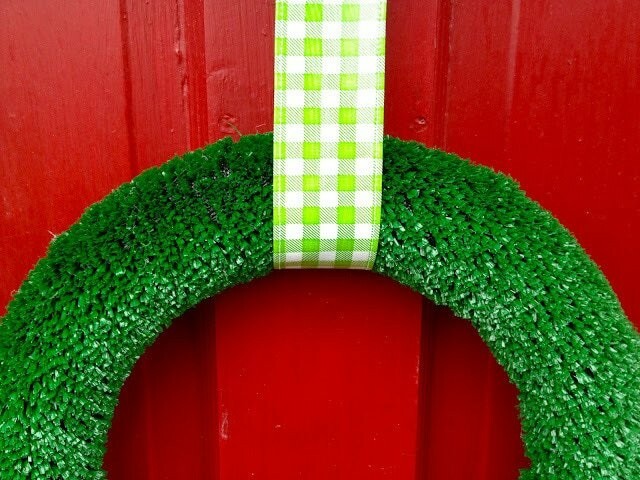 Rather than buying a Christmas wreath, why not make your own, using artificial grass? Here are some handy instructions for how to make your own wreath using artificial grass. You could also add pine cones, tinsel, red ribbon and some berries to give it an authentic Christmas look. No Christmas decorations would be complete without a Christmas tree. 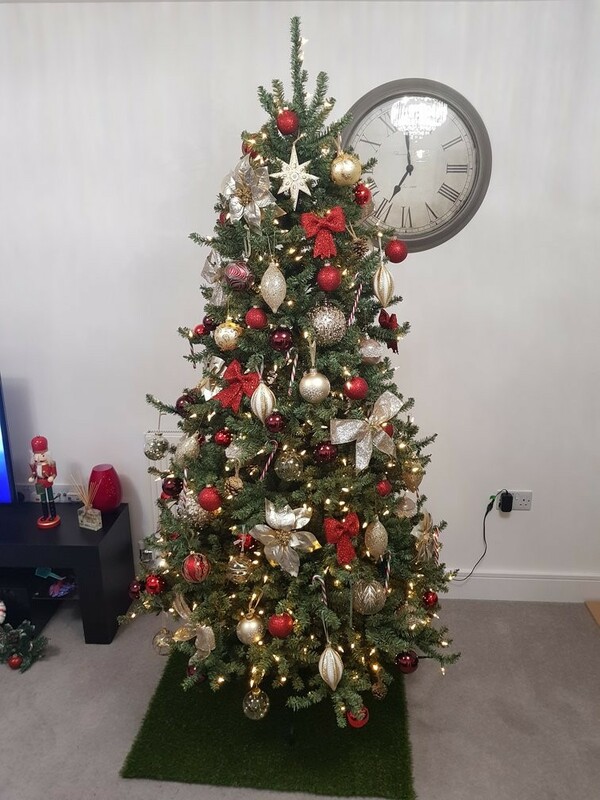 But one of the problems with having a Christmas tree indoors is that the weight of the tree means that the stand can often damage your carpets. And that’s why you need a tree mat. You can utilise offcuts of artificial grass to place on your carpet not only to protect it from damage, but also because it will look amazing – it will complement the tree perfectly, too. Add some eye-catchingly wrapped Christmas presents and you are good to go. Of all the ideas in this article, this one is probably the easiest to implement, and yet it’s still very effective. The main event on Christmas day for many of us is the much-anticipated Christmas dinner. It’s great to sit down with family and friends and indulge in roast turkey with all the trimmings. Its also important to dress the table for the occasion. You’ll, of course, need Christmas crackers, Christmas-themed napkins, place mats and a show-stopping table decoration. You can create a very simple, yet highly effective, table decoration by cutting a narrow strip of artificial turf – around 300mm wide works well – to use as a table runner. Place it in the centre of the table and make sure it’s long enough to run end to end, lengthways. You can then accessorise it by adding pine cones, candles, tinsel, baubles, reindeer or anything else you can think of to create a table runner full of interest. This one perhaps takes a little more time to implement, but it’s actually possible to create your very own artificial grass Christmas tree. Check out these quirky Christmas trees made by the Little Green Tree Company. If you have offcuts of artificial grass left over from installing your garden lawn, then you could use them to make your own tree. Of course, they don’t necessarily have to be this big. You could just make a miniature tree – or a series of them – to go on a window sill or mantelpiece. 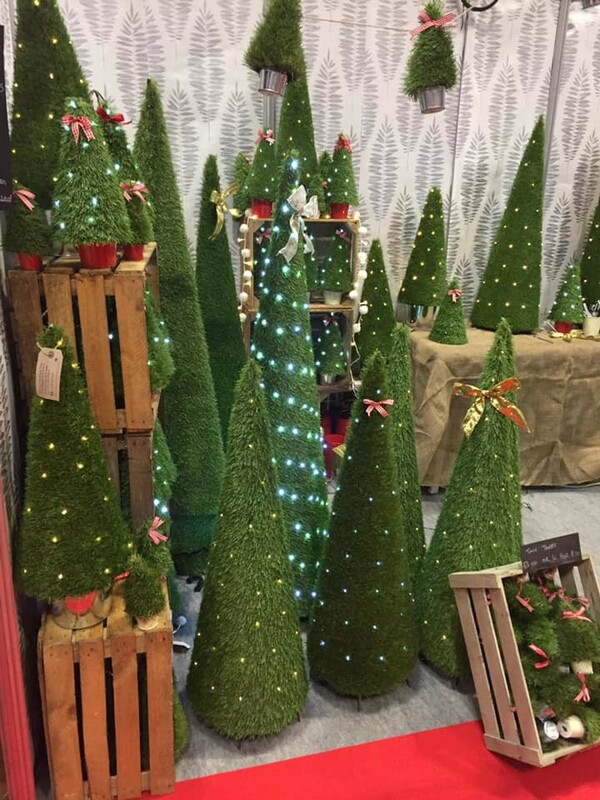 If you have the time, then we think that this is one of the best uses for artificial grass offcuts this Christmas, as they will compliment both indoor and outdoor Christmas displays. White artificial grass has been popular for commercial use in shop window displays, hotel Christmas tree displays and trade shows for several years. Now, more and more people are using it in their homes, too. You can use white artificial grass to create a wintry window display, or even put it under your tree stand to protect your carpet and complement the tree, as discussed earlier in this article. Add some fake snow to the tree to complete the effect. Perhaps more towards the extreme end of the spectrum, you could even temporarily lay it across your living room floor to create your very own living room Santa’s grotto to wow your children and guests. Let your imagination run wild and you’ll be sure to make good use of white artificial grass. We hope some of the ideas we have listed here have been inspirational in helping you to use artificial grass creatively this Christmas. But, of course, you don’t necessarily have to do anything quirky with artificial grass, you could just use it for its intended purpose – as your very own low-maintenance, mud-free garden lawn. There are lots of reasons to buy artificial grass this Christmas, and installing your own fake lawn in time for the festive period is great idea. There will be no mud or mess, so you can get outside in the fresh air and burn off that Christmas dinner with a family football match on your lush green artificial lawn. If you are considering installing artificial grass this Christmas, don’t forget to request your free NeoGrass sample pack, and see for yourself just how soft and amazingly realistic our artificial turf really is. And, if you would like a free installation quote from your nearest NeoGrass Approved Installer, you can contact your local professional here. Have you done something creative with your artificial grass offcuts this Christmas? Perhaps you have created a quirky decoration or wintry scene? If so, we’d love to hear from you – let us know your thoughts and ideas in the comments section, below. Thanks for reading and have a Merry Christmas.